The Palestinian Prisoners Society (PPS) has reported that Israeli soldiers have abducted, on Tuesday at dawn, five Palestinians in the West Bank governorate of Bethlehem, and five others in Qabatia town, south of the northern West Bank city of Jenin. The Bethlehem office of the PPS said that the soldiers invaded and ransacked homes in Teqoua’ town, east of the city, and abducted Qussai Jamal Salman, 16, and Mohammad No’man Jibril, 17. It added that the soldiers also invaded homes in Wad Maali area, in the center of Bethlehem, city, and abducted Ahmad Jamal al-Hreimi, 23, and Nader Ayyad al-Hreimi, 44, in addition to Khalil Khader Shouka, 23, from Hindaza Mountain, east of Bethlehem. Furthermore, the soldiers invaded homes in Beit Fajjar town, south of Bethlehem, and summoned Ahmad Salah Taqatqa, 16, for interrogation in the nearby Etzion military base and security center. 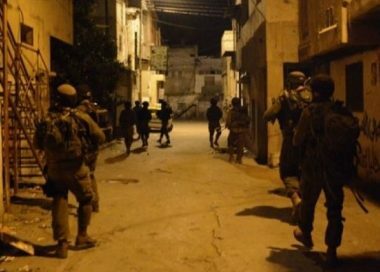 The Jenin office of the PPS said dozens of soldiers invaded and searched homes in Qabatia town, south of the Jenin city, and abducted Mohammad Lutfi Abu ar-Rob, Maher Sati Abu ar-Rob, Abdul-Aziz Hasan Abu ar-Rob, and his brother Abdul-Mon’em, in addition to former political prisoner Ali Kamil. It added that the soldiers caused excessive damage in the invaded homes, while violently searching them, and interrogated many Palestinians. On Monday at night, the soldiers invaded Mothallath ash-Shuhada village, south of Jenin, and broke into a Coffee-shop before assaulting many young.